While it is probably clear to long term readers, we have never described in detail our no man-made chemicals garden practice. Sometimes we describe our garden as organic for ease of description, but we don't even use organic chemicals and are certainly not registered by an organic licensing body. 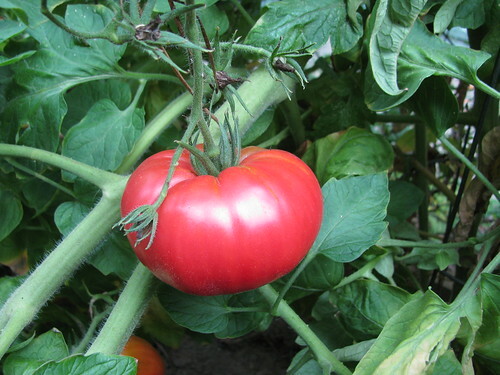 Our vegetables and fruits grow in garden compost, water, sun, and soil. That's it. Once this year, when the kale was infested with aphids, we considered spraying a natural soap and water solution. Out of sheer laziness, we forgot before the aphids were gone. Why not use man-made chemicals? Second, applying chemicals takes extra effort. Third, pesiticides, herbicides, and fertilizers can be toxic to kids and dogs. Since we often have young visitors to the garden and garage (where we store garden tools), we choose not to risk exposure by applying or storing toxins. Fourth, we don't want to be worried about rinsing chemicals off fresh fruits and vegetables. We often eat them right off the plant! Fifth, our garden grows well without man-made chemicals. Sure, yield might be slightly heigher with chemicals, but that isn't worth the risks or cost. We could and maybe should add ph balancing amendments, but again with the laziness. Testing and amending soil is a science we have yet to explore, though it has merits. Right now we love our simple, chemical free garden just the way it is.